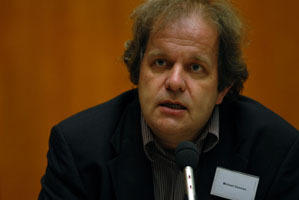 Michael Zeeman, Dutch journalist, writer and philosopher, passed away at the age of 50 in Rotterdam on Monday 27 July. I met Michael Zeeman just a few times – at several forums in the network of Berlin Conference “A Soul For Europe” but these meetings made me feel a great sympathy to this intelligent, open-minded and kind man. I have heard about him as a ruthless critic but my own impressions where quite opposite: while participating in the panels that he moderated I was always pleased not only with his professionalism but also with a feeling of a friendly support that was radiating from his massive figure. Many people will remember him as cosmopolitan, a cultural worker of United Europe. Maybe that is true, but as for me that is not the full true. I would like to recall one episode (unfortunately, I don’t remember exactly where it was – maybe in Skopje). At our conversation during the lunch, Michael suddenly told me: “You know, while living in the Netherlands I never thought about my nationality. But when I started to work in Italy, speaking Italian on TV, writing in Italian language in newspapers, I suddenly understood that I am Dutch and that this part of self-identification is really important”.